It started with an inescapable urge to watch Star Trek II: The Wrath of Khanand became a truly sacred Holy Week experience. When I’m working on a project like the audio commentaries Tim and I are doing forTOS and TNG, I have this tendency to be stubbornly linear, staying focused on what I’m watching for the project in the correct order without deviating. Okay, I kinda do that anyway, always watching things in order. But, in these cases I can get particular tunnel vision. Just doing DS9 concurrently with TOS and TNG was kind of a big deal. I’m also a sucker fort sitting down to watch one scene of a film I love and ending up watching the whole thing. So when, while doing some final editing on my essay for thebook I’m a part of, I watched part of Spock’s voiceover narration at the end of Star Trek II, I quietly congratulated myself for not at least watching the credits to hear James Horner’s amazing score. Of course later, after my wife and son went to bed, I was open and vulnerable. Sucker mode kicked in. If you’re unfamiliar with my other passion project, Jesus Films 101, you might not know that I’ve made Jesus films an area of close personal study for the past 20 years, even writing my Master’s thesis on the genre’s history. At a time when I’d normally expect to sit down in front of The Gospel According to St. Matthew or The Last Temptation of Christ, I was watching Star Trek II. And it was just as beautiful a devotional experience. 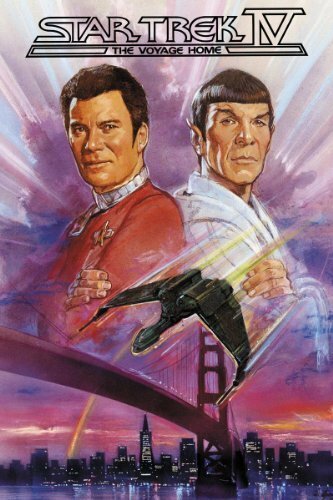 Then, inspired by my friend Scott Higa’s Nerdy Holy Week, I decided to watch Star Trek III the next night. Again, a beautiful experience that showed me things in the film I’d missed before. Wonderful. As I mentioned during Spocktober, that film is very underrated. So, the next night, I decided to watch Star Trek IV: The Voyage Home. You know, finish out the trilogy, enjoy a great Trek film, all that. The Spock-as-Christ figure stuff was over, but it would at least be fun. And who knew? Maybe I’d see something new this time. Well, I did. Boy, did I ever. In this whole process of The Undiscovered Country Project, I’ve occasionally had moments of profound revelation where a ton of stuff just crashes into my brain at once and I just about can’t handle the beauty. This was one of those times. Without going into detail, I’ll just say that Spock is not done being Jesus at the end of Star Trek III. Not by a long shot. When I told her this story, my ship’s counselor Leigh said “I love that you can have a ‘come to Jesus meeting’ while watching Star Trek!” She was very right in her description. My experience of Star Trek IV was a deeply sacred thing. Rarely have I been given such a profound sense of the gospel, such a beautiful picture of Christ’s love as I had that night. I can’t wait to share this stuff. It’s so cool. I’m not sure what form it will take just yet, but I’m not sure the blog is the place for it. Commentaries? Very possibly. I know for sure you’ll be hearing all this stuff in my presentations on Spock as a Christ figure. But the main point is: I had a beautiful, sacred experience of Star Trek over Holy Week. God is intensely good and Christ is visible in the Star Trek universe. And if you don’t know it, Jesus is worth following because he believed that the needs of the many (you and I and all humanity) outweighed the needs of the One (himself). It is therefore only logical that, not so much the needs, but the love and calling of the One should outweigh the perceived needs of the many–those of us who choose to follow him. Only in this way are the deepest desires of both God’s heart and humankind’s soul truly, deeply fulfilled. Only in this way do we truly Live Long and Prosper. I hope your Easter season was not only a joyous time, but a restorative one. If it wasn’t, there’s still time for that. The tomb is empty and the cross is a place of victory every single day. And sometimes that reality sneaks up on you while you’re watchingStar Trek. Wow! what a wonderful post! If this project grows and you need to hire anyone, let me know! You are an inspiration to me! I can’t wait to see your analysis of the trilogy (wrath of Kon, Search for Spock, and voyage Home). I’m still trying to figure out how voyage Home has some deep conceptual framework though. To me, it is a comedy of sorts! Like you though, I can’t resist watching Wrath of Kon and crying when Spock dies! Like Jesus, Spock doesn’t hesitate to comment on human faults. Vulcan priorities i.e. meditation, and mental discipline combined with the axium “The Needs of the Many Outweigh the Needs of the ew” are Christ-like examples for me. I am paraphrasing some of the ideas about Vulcan culture from Wrath of Kant. I’m curious to know your thoughts about the Kolinahr and its relationship to Christian philosophy. I think of the Kolinahr as a more extreme example of purifying one’s sould and repenting. For Vulcans, human emotion may be considered a taboo or sinful? studying Star Trek may deepen my faith and what a treat! I look forward to watching almost any episode of Star Trek so if my faith grows as a result I’ll keep watching and growing! Thanks for helping me see this relationship! I haven’t hired the people who are already working with me yet, but if I ever can, you’ll definitely get an interview. Yes, The Voyage Home is an adventure/comedy. That’s why I didn’t expect anything from it. The absolute surprise of what I found I think contributed to how powerful an experience it was. It just came out of nowhere! I agree to some degree with what you’re saying about Kolinahr. Certainly, I’ve commented before on Spock’s spiritual, meditative practices and monastic qualities. Thise things come from his Vulcan traditions to be sure. But the Kolinahr ritual itself is something Spock ultimately does not complete. I find this significant since it was supposed to basically shut off his humanity. Spock realizes, ultimately, that this is not his destiny. He must be both human and Vulcan, just as Jesus must be both human and Divine. So, it seems to me more Christ-like that Spock does not complete Kolinahr than if he had gone through with it. I’m glad Star Trek is informing your faith, much as it does mine, and I’m glad UCP can be of help in the process. Thanks for joining us on the journey! Hi, first, if yu need assistance with the Project, let me know how I can help! Good point about Kolinahr. I understood the need for Vulcans to rid themselves of emotion and thank you for your observations! I hope I have the opportunity to attend one of your guest lectures one day and if yu ever decide to hold virtual lectures via skype or another platform please let me know! Thanks again for sharing your journey with us! Thanks again for the offer, Becky. I’m keeping you in mind! I like the idea of doing a virtual event. We’ve been talking about some possibilities in that direction lately. I’ll let you know what we come up with! thank you and I look forward to seeing this project progress!